Holiday home, 3 Bedrooms, 2 Bathrooms. Can sleep 6. 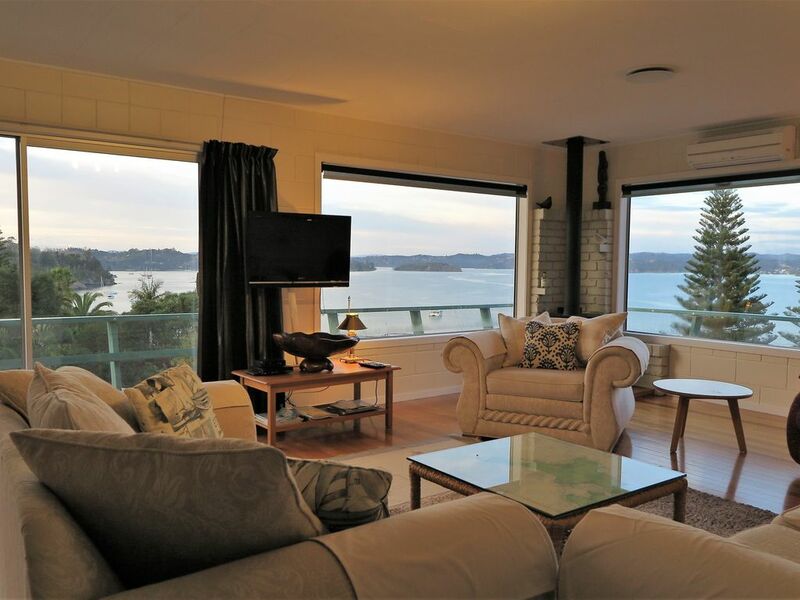 Early European settlers described Russell Harbour as "A Most Noble Anchorage" Our home has both panoramic views of this anchorage and also across the bay towards Paihia. The house is on a quiet street yet very close to the action in the village. A 6 minute walk takes you down to the restaurants and cafes in Russell. We are 7 minutes walk to the Flagstaff Lookout and adjacent to a bush reserve with lovely walks. The house has two bedrooms with Queen size beds and a third bedroom with two single sized beds. You can wake up in the master bedroom to the sight of early morning fishers or ferries leaving Russell. In the evening, relax watching the racing boats with colourful sails making their way around the buoys as you enjoy a drink or barbecue from our outside dining area. If you have a trailer boat there is some off street parking down our driveway or in front of the house on the street. Just ask for details. We do not live in the same house but are available if you need us.We will give you directions on how to access the house, so you can check in any time after 2pm. We have a bushy lower garden with pathways and hiding places for children and a concrete area where they can ride their small bikes or scooters. It's easy to find us as we are 8 mins walk from the pedestrian ferry from Paihia which links in with Auckland buses or shuttles to the Bay of Islands airport. If you come by car we are 10mins drive from the Opua vehicle ferry. We do advise you to keep very small children off the wooden part of our deck . A barrier can be put up on your request to keep toddlers safe. We have a strict no pet policy due to kiwi birds/ nesting boxes and web cams in the adjacent bush. We have a 10% discount for stays 7 days or longer. We had a wonderful time using this gorgeous home as our base for exploring the surrounding area. I would recommend this house to any family planning to visit Russell. It has all the comforts of home and if we return to the country in the future we would definitely stay here again. Thank you for allowing us to stay in this beautiful home. Out of our 30 day vacation, the 3 days In the “Noble View” has been the most relaxing. The house itself was our activity. The front room for all of us (5) felt homey and was breathtaking beautiful. We all lazed around reading and watching the sailboats. Our big activity was walking the shops and grabbing coffee in the quaint town (also walking distance from the house) and taking a fishing boat in the morning and then having the “Swordfish club” make dinner out of our catches. Highly recommend! We thoroughly enjoyed our stay at “A Noble View” - the views were amazing to experience and the house was very comfortable and beautifully decorated. We loved the location ( next to bush reserve and few minutes walk into town). We loved all the thoughtful touches within the house - perfect for our family of 4. We hope to stay again. A unique house and location - thank you! Perfectly situated on a hill above the historic village of Russell. Walking distance to trails and shops, restaurants, etc. A delightful, clean, comfortable home away from home with views to die for! We loved it and spent many happy moments sitting on the deck gazing out over the harbour. A very memorable place. Outstanding accommodation in picturesque surroundings. Our family enjoyed every minute of our stay at A Noble View. Our hosts Marion and Colin were excellent to deal with. The location was ideal to walk to town. We couldn’t wait to return after each day’s exploring to see how the harbour had changed. The accommodations were clean and well appointed. We were very sorry to leave but hope to return.